Wildebeest, oryx, hartebeest, springbuck and ostriches criss-crossing the dirt track aroused much interest, disrupting our normal discussion about fishing while driving to the river. From a distance the water looked like Yum Yum peanut butter (or as a recent dad I could relate it to infant diarrhoea, whichever you prefer?). To be honest, regardless of the colour, it didn’t smell bad at all. 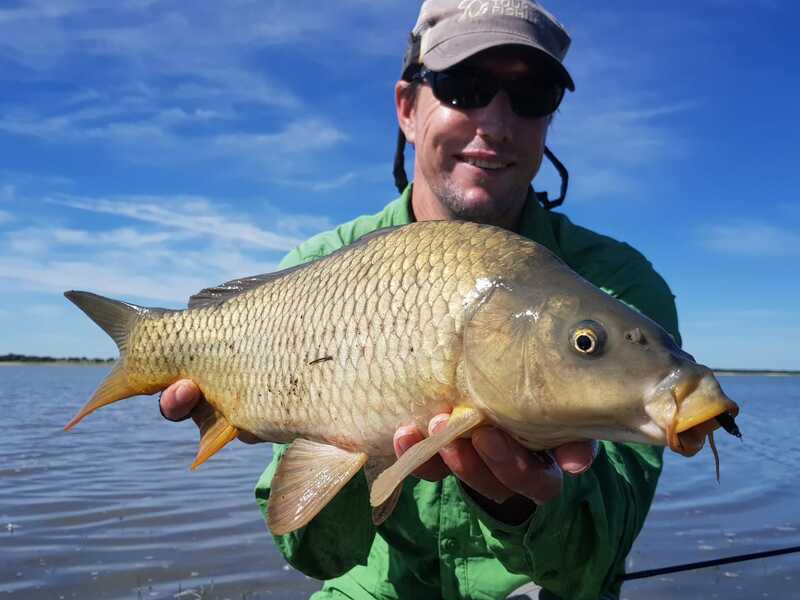 One could tell by the ‘fishy’ odour that this section of the Vaal’s water had high fish biomass and that it was a healthy system. 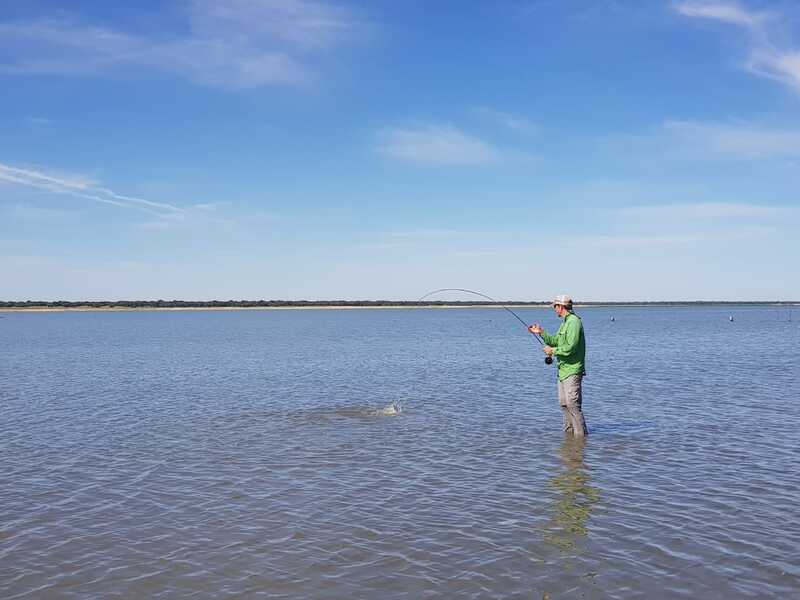 It reminded me of my introduction to fishing at Hartebeespoort Dam when the water was still turquoise and clear. I was three years old and the distinctive fish odour emanating from thick schools of canary ‘kurper’ scurrying around in the shallows attracted, rather than repulse me with a net and hand line. I was as excited to find fish and cast a fly in this brown goo now as I was with my nylon fishing net nearly 35 years ago. 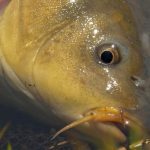 On water’s edge we noticed carp grubbing in the shallows. Some of these fish fed so close to the bank that their protruding hump backs looked like fat snakes on the water surface. The water was also surprisingly clear and schools of carp tailing in knee deep water looked like weed beds dancing in a chalk stream. Further out were foreign-looking fish with large black tails swimming just under the surface; they looked like packs of hunting elf. 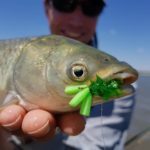 Terence Babich, our guide, said they were likely grass carp and that we should ignore them as they were usually very spooky and seldom ate flies rushing along like that. There was, however, very little catfish activity. 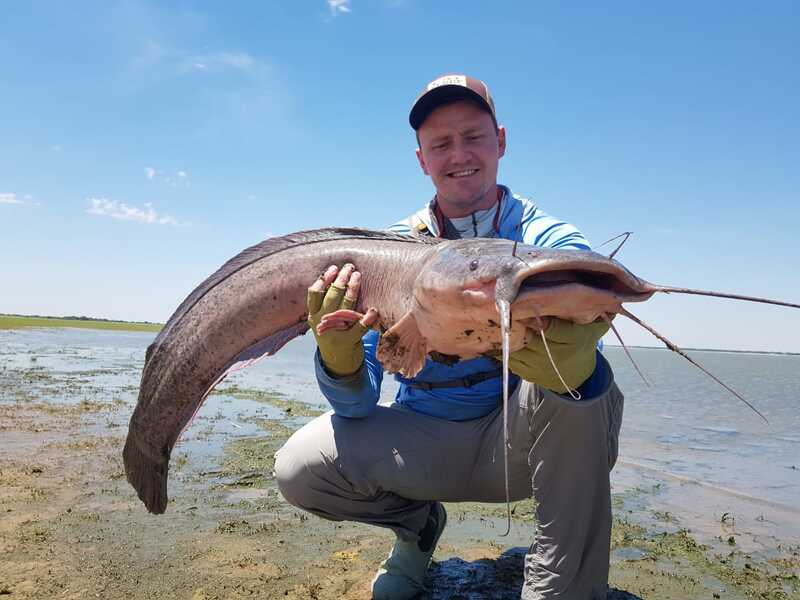 We were there to specifically target large sharptooth catfish with fly tackle. Terence, or Terry in short, had worked out a fly fishing method that consistently fooled these fish (and big ones) that located prey (usually small fish) by vibration and water displacement. 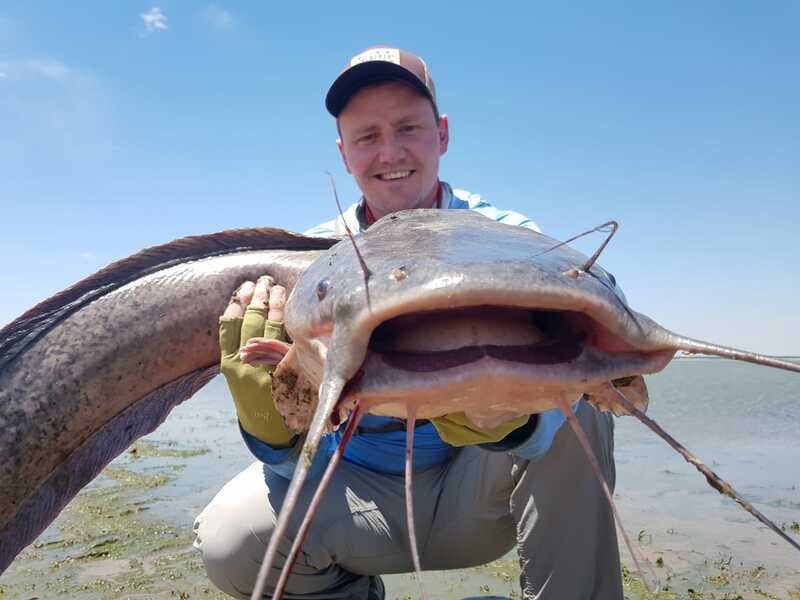 He had caught over 100 catfish in one day using his plopping method, his biggest a whopping 28 kg. 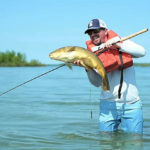 Jack Lotter (IG: Flybefok), the trip instigator and one of Terry’s catfish protégés, started the ‘plopping’ exercise waist deep while I tried to hook a few naïve carp in the shallows. Both of us hooked fish at almost the same time. Minutes later Jack landed a 4.5 kg cat while I slid a 1.5 kg carp into my hand. Then Jack got a stunning catfish of just over 11 kg, which convinced me, after releasing a few more carp, to join him in the deeper water. 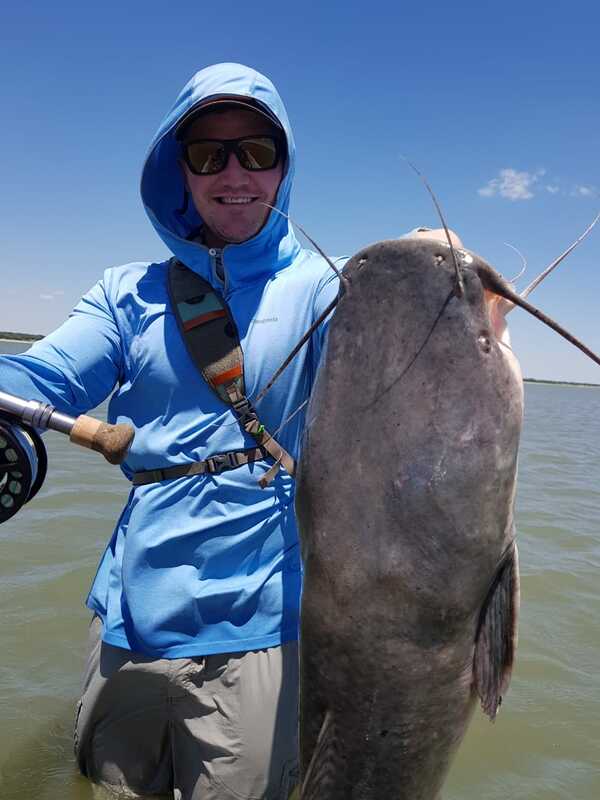 However, those were the last catfish we saw on the end of tippet that day; instead of a busy afternoon hooking countless cats, heavy cumulonimbus clouds gathered overhead and ended our fishing with flashes of lightning, dust storms and torrential rain. 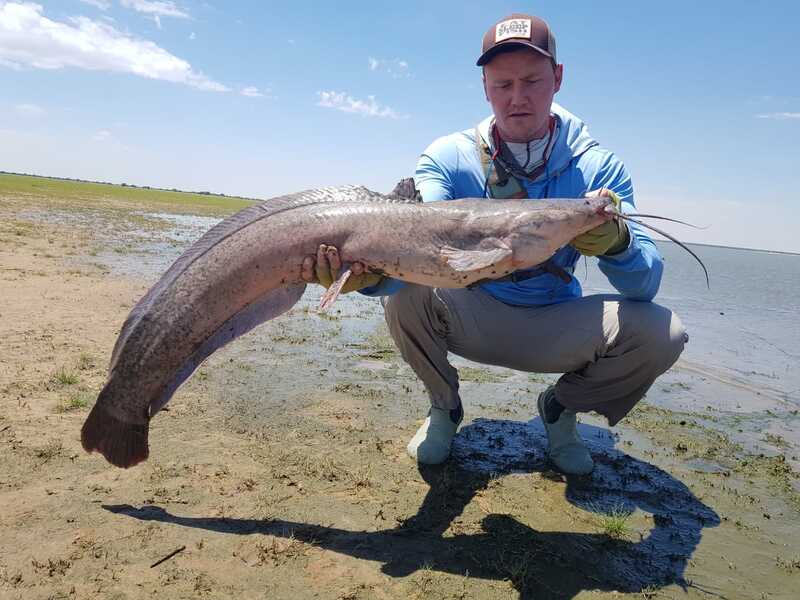 Jack Lotter with the first double figure catfish of the trip, one that weighed just over 11 kg.